In a press conference held today, at 11:00 at the Public Prosecutor's Office of the Court of Caltanissetta, Italy announced the result of an illicit trafficking investigation, long established under the code named "Demeter" which first started in 2014. In coordination with officials from EUROPOL and EUROJUST, the District Anti-Mafia Directorate of Caltanissetta and the Carabinieri of the Cultural Heritage Protection Unit of Palermo, in collaboration with the investigative nucleus of Caltanissetta, an order for the application of precautionary measures was issued by the Court of Caltanissetta, against 23 people. 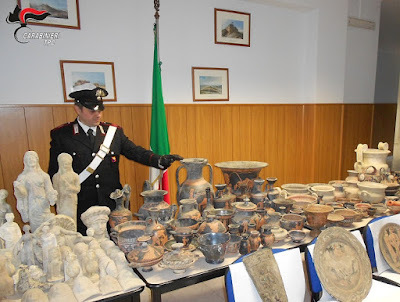 Precautionary measures, were issued to individuals in Agrigento, Caltanissetta, Catania, Crotone, Enna, Lecce, Naples, Novara, Taranto, Turin, Ragusa, and Syracuse, where simultaneously or in tandem, raids were carried out which also included searches for illicit archaeological finds. Precautionary measures against those taken into custody are those measures of privation or restriction of the rights of a person, adopted on the basis of a dual premise: the serious indications of guilt (article 272 c.p.p.) and the precautionary requirements related to ensuring their presence at judicial proceedings (article 273c.p.p.). According to the Italian authorities, Francesco Lucerna, a 76-year-old "tombarolo" from Riesi, a small town in the province of Caltanissetta, worked alongside a network of individuals fencing archaeological finds for decades uncovered via clandestine excavations. Many of these illicit excavations purportedly took place in the provinces of Caltanissetta and Agrigento, areas in Sicily which are rich with ancient objects of Greek and Roma production, many of which date back to the IV-V centuries BCE. The plundered objects dug up by this group were transported to Northern Italy via middlemen and from there made their way into collectors hands and the greater European art market. • Palmino Pietro Signorello, 66, from Belpasso (CT). • Luigi Laroce, 62, from Strongoli (KR). While most of the individuals implicated reside in Italy, three others were arrested in Great Britain, Germany and Spain. Rocco Mondello, 61 years old from Gela, a resident of Ehingen, Germany. Each is accused in various ways of criminal association and/or the receiving of stolen goods as it relates to the trafficking of antiquities. William Thomas Veres has been previously arrested in Spain on August 16, 2017 on un unrelated trafficking case via an extradition warrant from Italy for the alleged theft of antiquities and cultural heritage objects. Veres was also given a suspended sentence of one year and ten months imprisonment for his role in a November 09, 1995, U.S. Customs seizure of a $1.2 million fourth century BCE gold phiale used for pouring libations sold on to Art Collector Michael Steinhardt. Utilising a European Investigation Order issued by the prosecutor of the Republic of Caltanissetta and with the coordination of EUROPOL and EUROJUST, searches were conducted abroad where numerous archaeological finds, 30,000 euros in cash and documentation useful for further investigations were all seized. Investigations are also reported to be ongoing at two auction houses located in Munich, Germany. Entered into force 22 May 2017, a European Investigation Order is based on mutual recognition, and requires that each EU country be obliged to recognise and carry out the request of the other EU country, as it would do with a decision coming from its own authorities. In total some 3,000 archaeological objects are said to have been recovered with an estimated value of €20 million. Placing value on material culture outside of their context though cheapens the loss as the loss of context and what we can learn from the objects found in situ is not factored in their estimated valuation. Interestingly this network is also believed to have been involved in counterfeiting ancient coins and other objects intended for sale when the demand for ancient material exceeded the supply chain's capacity to provide looted material.